Call it the inevitable reaction to an over-reaching corporation — angry users are venting online and demanding, via a Change.org petition, that Adobe withdraw plans to stop selling Creative Suite. Adobe announced the phase out of perpetual licensed boxed software and the forced march to its subscription-only Creative Cloud on Monday and the backlash only continues to build. The fundamental issue is users that buy each new version will save money by subscribing to Creative Cloud, assuming Adobe doesn’t jack up their prices, while those that only upgrade when the need demands (a.k.a. hardware and compatibility issues) every so many years will pay thousands more. For many independents and freelancers, Adobe’s effort to force its customers into pay forever software serfdom is more than galling. One fed up user, Derek Schoffstall, got fired up and turned that anger/energy into a Change.org Petition, which has attracted more than 7,000 signatures. You should support this petition because Adobe is making their already expensive products even more expensive in the long run. Adobe is robbing small business, freelancers and the average consumer. They do not seem to understand that every company is a not multi-national, multi-billion dollar corporation that has an infinite amount of resources —Derek Schoffstall, petition author. 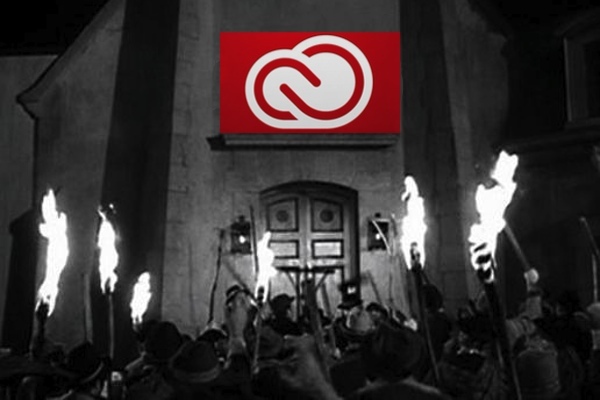 Although many Creative Suite customers have expressed outrage over Adobe’s move, simply dumping Photoshop et al requires more than a learning another application. “Maybe I should just chuck PS now and go with something else, which is apt to be quite a wrench after being on PS since version 2.5, sometime in the last century,” writes Fairer Platform commenter Seth. Users have invested years, sometimes a decade or more, as well as thousands in Photoshop specific training, add-ons, plugins and hardware. For video editors that have built workflows and archives around Adobe’s Premier video editing software, the chains that bind them to the platform are almost indelible. That said, Adobe Photoshop competitors, like Pixelmator, are celebrating the opportunity now before them. Confidence in this case verges on cocky. Nevertheless, Pixelmator, as well as Flying Meat’s Acorn and the open source GIMP, want to be your new image editor(s). And, honestly, who doesn’t believe that Adobe Photoshop’s dominance of the image editing segment isn’t ripe for disruption, especially now?